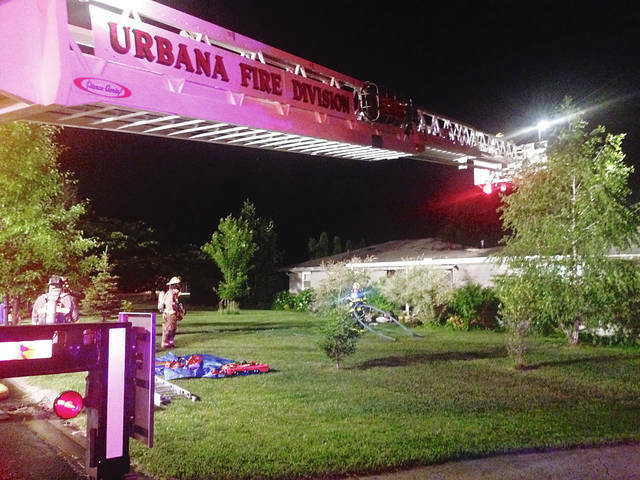 Urbana Fire Division crews respond to a residential fire at 1032 Bon Air Drive on Thursday at approximately 11 p.m.
Fire severely damaged a home at 1032 Bon Air Drive just before 11 p.m. on Thursday. The Urbana Fire Division and the Urbana Police Division responded to the scene. According to the Champaign County Auditor’s Office, the house is owned by Marjorie Moffitt. No information about the identification of the residents of the house was immediately available, but officials on the scene said the occupants escaped without serious injury. 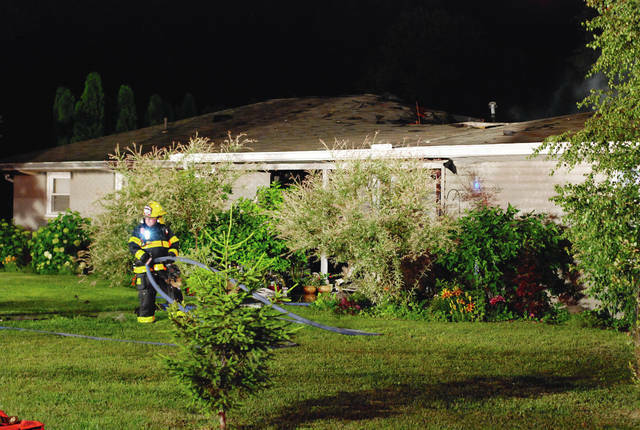 No information about the cause of the fire was available as of midnight. As crews fought the blaze, part of the roof of the house collapsed in the middle. Smoke from the fire was hanging thickly over the east side of Urbana from Scioto Square and extending west toward Jefferson Avenue in the stillness of evening after the flames were extinguished. Check back at www.urbanacitizen.com for more information as it becomes available.